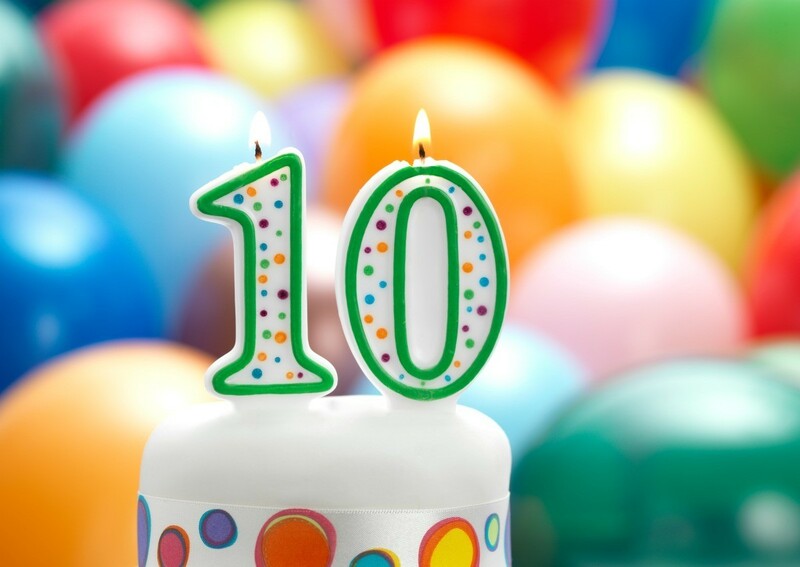 Reaching 10 years of age is a very special milestone. This guide is about 10th birthday party ideas. I threw a Candy Land party for my last daughters double digit party. I used the game story as my travel through Candy Land in search of King Kandy. After each character paragraph read, we'd play a quick game, read another paragraph, another game. I had the basement decorated thickly in streamers and balloons to give a candy land feel. We ended the party watching Barbies Sugar Plum Princess (since the king is finally freed). This was a sleepover. For the cake, I made an ice cream/ cake cake. The bottom circle pan and top small circle pan were made of cake and the middle pan was peppermint ice cream. I decorated with egg white fluff frosting and sprinkled licorice, gum drops, crushed peppermint candies, and upright lollipops around. We had molasses cookies and peanut brittle for snacks. It was a big hit with all girls ages 9-12. It may sound young, but I felt it was the last real kid party she'd ever have. You could have a cheerleading party? There are lots of companies that do them if thats not her thing how about going to the zoo? If she likes sports how about ice skating or roller blading? If shes really girly then spas are very fun and good for growing up or if she enjoys singing do a recording studio party rent out a studio at somewhere cool! My daughter's tenth birthday is coming up and I want this one to be special. It has to be at home. It can't be a sleepover, cooking, laser tag, tea party, bowling, or swimming. Please help. My daughter is turning 10 in 16 days, but I have nothing planned for her party. Please help me! I'm turning 10 in 2 weeks, heres what I'm going to do, swimming and a sleepover with my BFF. Simple, fun and free. I find that awesome. My daughter and her friends are going to Hibachi and we're watching a movie at home. It might be a little expensive, but you only turn 10 once. We are inviting 5 girls that are really close to my daughter. I hope this helped you! What kind of party should I have for my daughter who is turning ten? My daughter had a dance party with her friend's dance mixes and she had a lot of fun. You could play random games and DANCE! Why not a sleepover party? I'm turning ten as well, and most girls love it. You could do a little spa and have some girls come over. You can bake cupcakes and they can choose their on toppings. You could have pizza for dinner. For a theme, you could do a 'camp out". Set up a tent in your backyard or in your house. It can also be made out of sheets. They can hold a flashlight to their face and tell spooky stories. They can roast s'mores in the fireplace. If you aren't outside, then you can play a CD of crickets and stuff from outside. Trust me, she'll love it! I don't know what to do. She wants a sleepover with 3 friends, but I am saying no I have to think about it. Also she wants to make her own pizza and lemonade and Coke, etc. I don't want to spent too much. What do I do? Please give me solutions. Well, I am thinking that this is a very small and low budget request. Three friends is not a very large number, very manageable, and making your own pizza with Coke or lemonade for drinks is going to be very low cost. I think your daughter has asked for a very modest party and I think that you should allow her to have this. The girls can play board games or watch movies for entertainment, and stay up late and giggle. Be a sport, mom, and say yes. It takes so little to make happy memories for your children. Her request doesn't sound out of line. Why not give her a budget and let her price the treats? It'll be a good learning time and if she sees it's too much, maybe she would be happy cutting back but still have her friends come over. You know the friends are the best part of a birthday! My son turned 11 this year and wanted an endless guest list. I found a cheap place to rent ( our local YMCA) and didn't have to pay per guest, just for use of the gym. They played for two hours, and gobbled cake and punch,then water from the fountain when the punch was gone. He said it was the best party because he could invite ALL of the friends he could think of! My oldest daughter is turning 10 in 3 weeks and she wants a big party. When I say big I mean lots of prep and trouble; but she only wants 3-7 friends. She has said no to bowling or rollerblading. I suggested spa party, but she said that is a bit boring and not very exciting. She says "yes" to a sleepover, but she wants more than the average sleepover. She is a feminine type and so are her friends, but not too fussy. She is in a new school and has new friends so she wants to impress them with her party, but not to much trouble for me. Any ideas are welcome! Do you have a mall nearby? One of my daughters favorite parties was a mall scavenger hunt. We broke up into teams, they had cameras and had to go through the mall searching for different items that they either (cheaply) purchased with money I provided (a certain flavor gumball from the candy store) or took a picture with (all of them crammed in the "rocket" in the kids rides). I had an adult with each group for safety and verification. Each team had a different list that I went to the mall and made up the week before. About 7 items each, but you could share tasks, but in a different order on the list. You could then go back to your house for pizza and cake and the sleepover with a movie. Tweens love to try "grown-up" pampering. Working with foster homes I've had to be inventive with a small budget. If you have a hairdresser or nail school nearby you can ask for a student to come pamper the girls with hair chalk or manicures/pedicures. They need hours to pass their course so you usually can find one or two to give you a hand. The girls sleeping over feel like little princesses. You can give the students a small tip or ask them to join the food. With one 10 year old I was working with, she wanted to be a belly dancer. I contacted a school that educates students to become teachers. They sent 2 dancers that brought along some costumes. It was fun even for the adults. 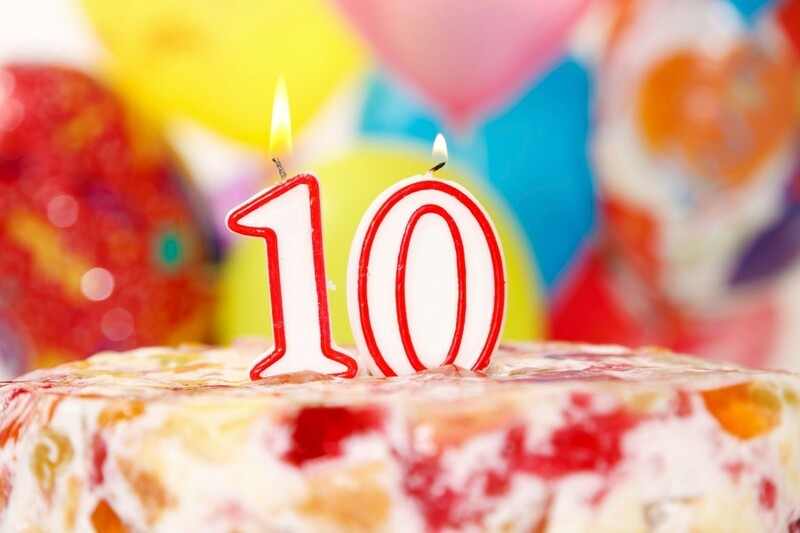 What should I do on my daughter's 10th birthday? It is on the 12 of December, but she doesn't want to go to the cinema, bowling, or a theme park because she has done all those things before. Maybe some sort of craft party where the girls can make things? If you look around your area you might find workshops where they can decorate their own pottery or make jewellery. Something like that would be pretty easy to do at home as well. Some beauty schools let groups of girls in that age group have birthday parties in their school. If I remember right it was manicures and pedicures. Cosmetology students do the work on the girls. But my thought is why not just do a family get together, with whatever family members are able to attend. My daughter's turning 10 and she wanted her birthday to involve Shakespeare. Fortunately there's a free summer Shakespeare festival in Fresno and we can take her and her friends to see the Merchant of Venice under the stars. We could be admitted to the amphitheater at 7 and party at a picnic table or on the grass there until the show starts at 8, or we could set things up earlier elsewhere in the park, but not much earlier, because it's hot here in July. Any tips or ideas? I was thinking we could have a bit of a Venice Carnevale theme and decorate masks, but maybe we should just keep it to simple food and cake or we'll be too rushed. That's as far as we've gone. Any ideas on this? Thanks so much. I think that you wouldn't need much more than a picnic supper and cake before the play. This is a pretty full evening. You might want to do some research on the play, and talk about the plot with the kids before they see the play. I have taken my kids, who are now adults, to see Shakespeare, starting when they were 5, but the tragedies, with swordfighting and so on are easier to follow than the comedies, as it is tough to get the jokes. Merchant of Venice is a pretty complicated plot. KISS - Keep it Simple, Sister! Forego the cake and bring a variety of cookies (maybe pizzellas or biscottis), sub sandwiches, with an Italian flair, chilled grapes and strawberries, and individualized waterbottles (landfills, y'know) as a takehome! My son is turning 10 on 19 August 2010 and I want to celebrate his birthday on 21 August 2010 because his birthday is during the week. I want to take him and his friends to a park for a day. What can I do to make his party special? He likes the idea of going to the park. Best idea. Just ask him what he thinks would be cool. I have a daughter who just turned 10. All the things I thought of were totally uncool and I probably would never have heard the end of it. 10 year olds seem to be that weird age where we as parents still see them as children, but they don't see themselves as young as we see them. They are ready to help make decisions about things that effect them in some way. My daughter is turning 10 in 2 weeks. She doesn't really know what she wants, but it definitely has to be her best party ever. She is still a playful little girl and still loves her dolls and make up. What theme would do for this character? Do you think she's outgrown the princess and fairies theme? Please help with suggestions for this whole party preparation in its last minutes. My daughter will be 10 soon. I find that the older they get the less you have to do. As far as themes we stopped that about two years ago. I now focuss on colors when it comes to birthday parties. This year will we be doing a "Girls Day Out" she has invited 3 friends and we will do lunch, Movies, a trip to the arcade and back home for cake and ice cream. Girls usually just want to hang out since they don't get to in school. My daughter is having a birthday on March 28; she is turning ten. I don't have anything planned. What do I do? See what your kid likes or watches to find ideas. You might not know to much about this century, but by sure to type lol in everyones invite. Also make it unike to their personality. Good luck in whatever you chose. My daughter is turning 10 and I don't know what to do. She does not want a sleepover. For a ten year old birhday parties are easy. Since she doesn't want a sleepover she might just want a small party with her close friends. If that is the case you could take her and her friends out to dinner or a movie. If she is girly you could take her out to a spa. Hope this helped you decide. My baby girl is turning 10 in half a month and I have nothing planned for her birthday party. Please help me. My daughter is having a 10th birthday on February 23, in like 19 days. Please help. My daughter's having a 10th birthday soon and I was wondering what the best party activities might be. I would like to know what type of party to have, by type I mean sleepover, scavenger hunt, etc. Sleepover. I would have her pick out some of her closest friends and invite them over. You don't even need a venue! Just let them have fun! What could I do for a 10 year old's best birthday party ever? Ask her what she likes or what she wants to do. Also Pinterest is a great resource. What do I do for my ten year olds birthday party? I can't think of anything do. If you know what I can do, I will need good things and twenty things, ASAP. Thanks. This is a guide about 10th birthday party ideas for girls. 10 year old girls enjoy a variety of birthday party themes and activities depending on their personality and interests. This is a guide about inexpensive 10th birthday party ideas. Throwing a birthday party that is both entertaining and inexpensive can be difficult. Here are some ideas to consider. I am an OT who works with kids. My first question is do you really need to have such a large group? Is this for family or other kids? Is he comfortable with the family, or with having so many people around? Would you do better to have a pot luck for family, with a small (4 or 5 kids) party another day for kids? I think I would keep everything as simple as possible; and keep the time frame short. I would also designate one area or room as his "quiet"; spot, to escape to if the festivities become too much for him. What does he like to do? What are his interests? There are a lot of simple, inexpensive games. 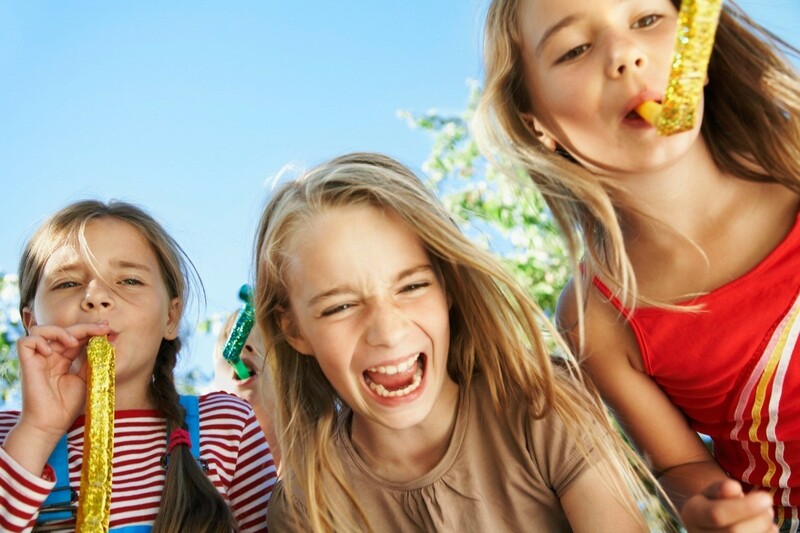 Think back to our own parties when we were kids: trying to drop clothespins into a milk bottle, balloon races, pin the tail on the donkey, bean bag toss, etc. There are many websites with simple crafts, if your son likes projects. The mainstream craft stores will often put the white painter caps on sale for 2/$1, and they can be decorated with permanent markers. I am still intimidated by the number of guests you're thinking of, though. You can also ask his teacher and OT at school what suggestions they might have. Let us know what kind of things he likes, and we can help with more suggestions.